Kelly asks: When did women and men start shaving different parts of their body? Both sexes have a love-hate relationship with removing body hair. We’ve been pulling, plucking, burning, tweezing and ripping out undesirable hair since the dawn of time. It’s believed that as far back as 4,000 B.C., women were using dangerous substances like arsenic and quicklime to get the job done. Meanwhile, the Egyptians, who never did anything halfway, removed all of their body hair from head to toe. They really liked the sleek look, but it also had a practical purpose. Being hairless discouraged the spread of disease and vermin such as lice and other icky creepy-crawlies. By 500 B.C., Roman ladies had learned how to use pumice stones and even a primitive version of the razor. Let’s fast-forward to more recent times. When did our modern-day obsession with silky-smooth armpits and legs first take hold? As far as armpits are concerned, we can pinpoint it almost to the day. In May of 1915, the upscale magazine Harper’s Bazaar ran an ad featuring a young model in a sleeveless, slip-like dress posing with both arms over her head. You may be thinking, “So what?” Well, up until that time, fashion – and propriety – dictated that women were covered to the wrist and to the ankle. A dress that exposed the underarms was nothing short of revolutionary. In fact, just the utterance of the word “underarm” out loud was enough to call for the smelling salts mere weeks earlier. Now, it was becoming perfectly acceptable. It also meant since underarms were body parts that had always been covered, whether or not they needed shaving had been a moot point and little discussed. If it didn’t show, why bother? And yet, here was an ad cajoling women that it was necessary to remove “objectionable” hair. To think just days earlier women had no idea such a problem even existed! There were several marketing strategies employed to lure women into jumping on the shaving bandwagon, most of which appealed to the timeless desire to be trendy. The obsession worked its way down to the middle class slowly but surely, as sleeveless and sheer dresses became popular among that demographic. Women’s razors and depilatories were finally being offered for sale in the Sears Roebuck catalog in 1922. This was the same year they started to sell – you guessed it – sleeveless and sheer dresses. By this point, advertisers didn’t feel the need to justify their product’s purpose anymore, and could instead start spending their budgets differentiating their product from their competitors. This meant that women had been won over – or brainwashed as some might say – and it was no longer a question of convincing them if they should shave their underarms in advertisements; now it came down to convincing them that a particular product was the best choice to remove the hair that women didn’t realize until recently was objectionable in the first place. The leg shaving phenomenon was a lot slower to catch on. It’s true that during the 1920s the flappers brought with them a decade of much shorter dresses coming into vogue, but by the 1930s hemlines became much longer again. There were some fashion and beauty writers loudly proclaiming that leg hair was on a par with leprosy, boldly referring to it as a “curse”. Regardless, it seemed that the majority of women were content to leave well enough alone and not worry about shaving their legs. The fashion mavens just couldn’t stir up the same frenzy this time around as they had with armpit hair. It seems that most women were a tad more hesitant when it came to shaving and therefore drawing attention to their legs, as opposed to their underarms. After all, the leg’s closest neighbors are the “private” bits. You wouldn’t want anyone to think you were that kind of girl, or give men any kind of wrong impression. Then World War II erupted, and that iconic pin-up picture of Betty Grable became part of popular culture almost overnight. It’s only a slight exaggeration to say that the women of America have been shaving their legs ever since. Why, you ask? Because Betty’s legs looked amazing, and to emulate that look, you had to wear a short skirt and sheer stockings. You also had to shave your legs, as nothing killed the effect you were trying to create more than leg hair poking through your silky stockings. Now, what about the guys? It’s impossible to know who the first men to shave their beards were. It’s pretty certain the story begins during the Stone Age, where cave paintings show Neanderthal man using seashells as tweezers to pluck out unwanted hairs. Flint blades, believed to be the first razors used for shaving, have been dated back as far as 30,000 B.C. Flint would provide a very sharp edge, but would also become dull very quickly. Therefore, it’s probably safe to say that flint was man’s first disposable razor. There is evidence that in ancient times Egyptian men shaved their beards for religious as well as aesthetic purposes. For the most part, it’s the Egyptians who are given credit for introducing shaving as part of a daily hygienic routine. Shaving was very important to Egyptian men, as facial hair was indicative of personal neglect- so much so that affluent people typically kept a barber as a member of their household staff. 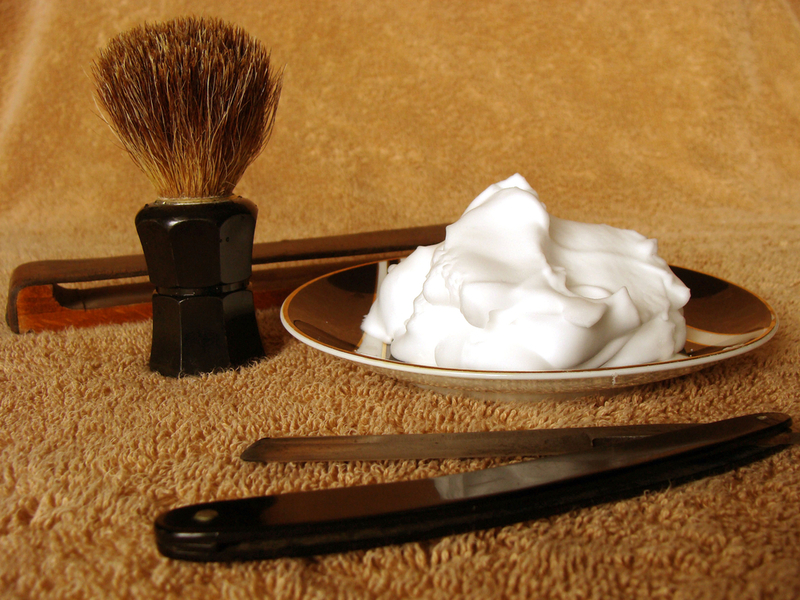 Alexander the Great is thought by some to have introduced the practice of shaving to the Greeks around 300 B.C. Even if his role there is overstated, he definitely was a huge proponent of it and helped popularize shaving among the Greeks. It is thought he took up the practice of shaving his beard as a beard gives the enemy something to grab onto during battle, putting soldiers with beards at a distinct disadvantage. Not surprisingly, cropped hair and closely shaven skin became all the rage in Greece at the time. Whatever the case, it’s plain to see that our relationship with the removal of unwanted body hair is a long and colorful one. Once mankind was gifted with the invention of toilet paper to ball up and staunch the bleeding from the inevitable shaving-induced nicks and cuts, we could realize just how difficult the landscape our ancestors had to traverse really was. I heard that the tradition of ladies shaving their underarms comes from the 1800’s American wild west. Prostitutes of the time shaved themselves to show to prospective john’s that they were free of lice & other filth borne diseases. I have no citation to back it up, just something I learned in my travels. I’m late to the party. I recall reading something about this (regarding pubic hair) about History of Greeks in the American West. I cannot recall the book as it was over ten years ago. It may have been “A Greek Odyssey in the American West” By Helen Papanikolas. We had more than one book for the class, but the image on the cover does seem familiar. Umm…there are almost no cave paintings depicting humans (and those that exist are pretty much stick figures), none showing Neandertals, and certainly none showing shells being used as tweezers (!). In the absence of pictorial representations, there is also no evidence flint blades were used as razors, even if they could have been. This is why college students are not allowed to use internet “research” for their papers. Why didn’t you ask where the references for this article are? The person making the historical claims should be the one to cite references first. The claims in this article might very well have a basis in fact, but since this article has no references it’s as good as a myth until there’s evidence to support it. Why did they even bother to write an article without mentioning where they found the research? It suggests they didn’t do any research at all. Even if a person is a trained historian they still need to provide evidence when writing an informative essay. Christians follow a Biblical timeline…..our earth is just over 6000 years old! What an idiotic thing to postulate. I believe in Christ and think the earth is 6 billion years old. Now what are you going to say? Jeeze they’re just stating a fact. Stop blaming them for that. With spelling and grammar like that, it’s no wonder you add nothing meaningful to the conversation. A small group of Christians following this timeline.